We at xInvest Consultants spend bulk of our time analyzing new growth opportunities. A very typical scenario is a manufacturer that may sell a chemical to automotive, aerospace, consumer electronics, and medical device market. After research and development, they have now been able to develop a formulation that maybe sold to semiconductor manufacturers. They believe that their product can replace existing chemicals, lower the cost for their customers, and speed up the process. 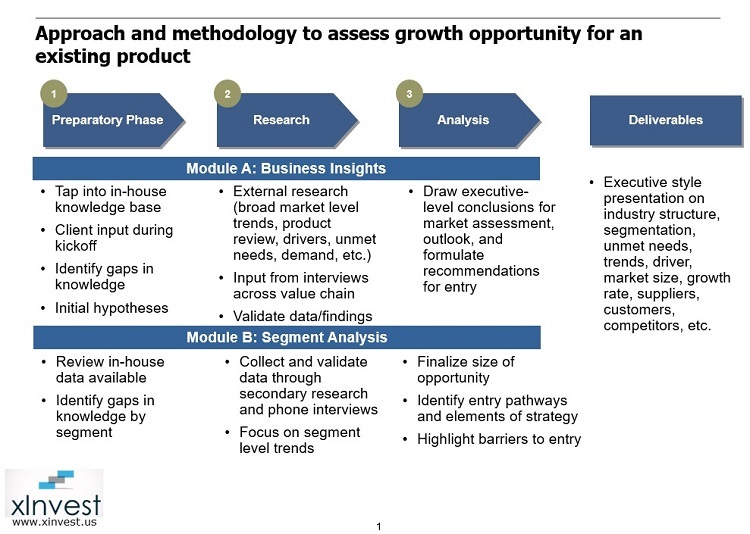 However, in order to find out how big the target market is, how is it segmented, what are the trends, what does the competitive landscape looks like, how will competitors react to a new product, and what can be done to successfully penetrate this market, they must do a comprehensive market analysis. When they come to us with a situation like this, below is the process that we typically use. What I want to emphasize is that clients must do as much research as they can on their own (if possible) but hire an outside consultant (either because they do not have the resources in-house or because an unbiased opinion is a must) at some point. It is a fact that when you talk to a potential customer, you will not get the answer that we will get. Since consultants like me work across industries and technologies, we can bring unique perspectives and insights. In addition, we are trained to look at every observation, conclusion, and comment with a critical eye. The best approach is the one that combines the internal findings of a firm with that of an independent consultant.